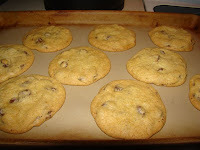 Just Another Day...: Cookie Time! Today was the beginning of what will most definitely be a mommy-daughter tradition: baking cookies! What a fun time we had! 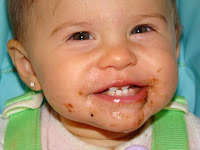 The best part that this was LO's first taste of mommy's chocolate chip cookies! We made them together (as best we could considering she's only 1!) and she got to enjoy all the best parts of baking! 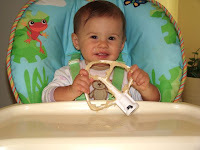 Here she is enjoying the beater. Isn't that really the best part of baking anything? Yum! 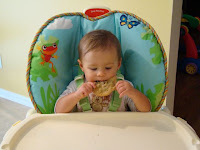 Once the cookies were cooled, she got to have one of her very own! Mmmm! 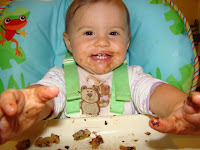 Do you think she enjoyed her first chocolate chip cookie? 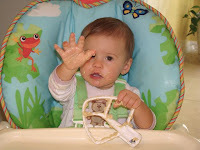 Of course I'm not a cruel mommy... You can't tell from these pictures but LO did have a sippy cup of cold, refreshing milk with each phase of our cookie baking! You can't eat chocolate chip cookies without milk, silly! This is darling! What fun!!! 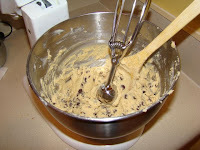 I can't wait to bake cookies with my girls. 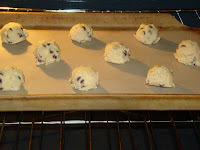 The first time I made your delish cookies, Pressy wouldn't sleep so she kinda helped me! She was in my arms the entire time. And, I love your wish list! Thats awesome, I'm going to have to add that to my blog!! 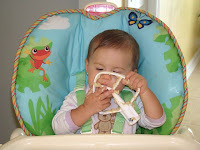 We registered for and received the same highchair! !